Vox Restaurant in The Grand Hyatt Berlin is unusual in that it offers a sushi and sashimi selection as well as a contemporary European menu. The restaurant, located on the ground floor of the hotel, is buzzy and modern, and oozes a hip-n-happening vibe helped in no small part by its dark décor and sleek lines. The open plan kitchen is divided into two sections each catering to the two different elements of the menu. A bar graces the entrance to the restaurant which was busy partying away on the night of our Saturday visit. We decided to try the Japanese side of things first and elected for the nigiri, maki and sashimi collection (€29) as well as an ebi (prawn) roll (€18) with unagi (eel) sauce. In a city not famed for its sushi, our offering proved to be acceptable. 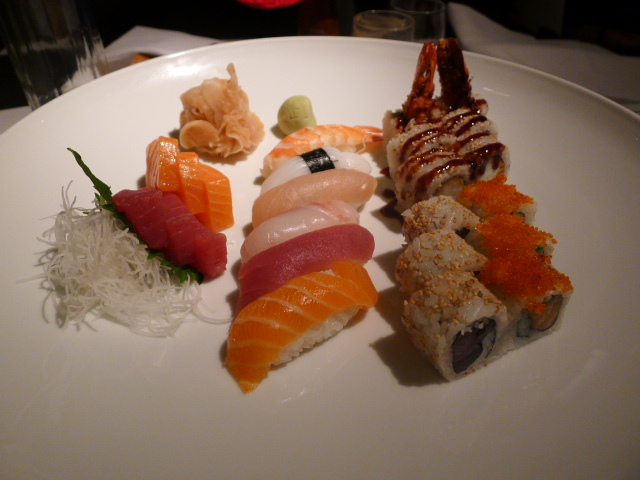 The fish was fresh and palatable, although we longed for salmon and tuna which were a little fatter and richer in taste. Also a touch of something sweeter, perhaps some Japanese mayo, would have really helped to lift the prawn roll. A miso soup (€6) was delicious, but we found a seaweed salad (€12) to be disappointing. The seaweed was a little chewy and bland, and the dressing a little too acidic. 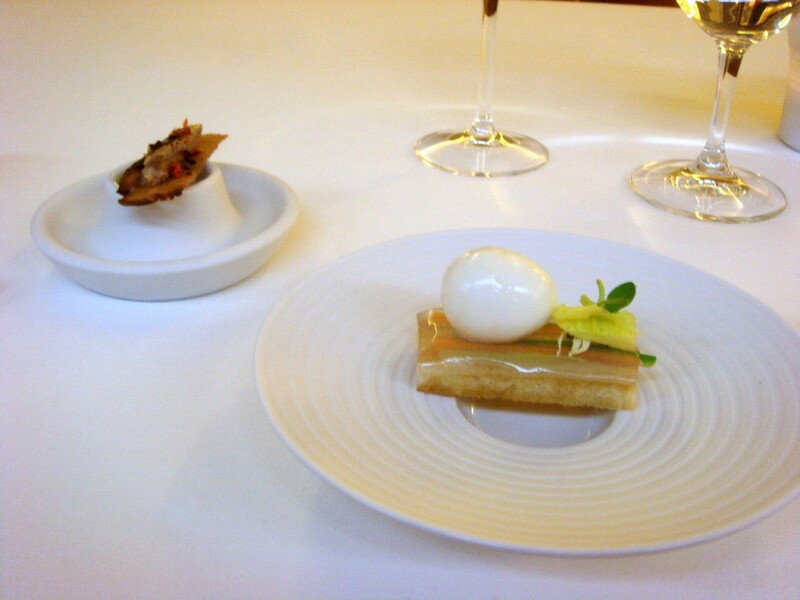 La Soupe Populaire by Tim Raue (a 2-star Michelin chef of Restaurant Tim Raue) is about as ‘Berlin’ as it comes. Grungy, soulful and heartfelt, the restaurant embodies the essence of understated cool. La Soupe Popularie is located in a building known as The Studio House, a once derelict building on a large block of land, not far from central Berlin on the border of the well-known Mitte area. The building may have been unused for a while, but most Berliners will tell you that the site use to house many an underground party, all of which adds to the building’s sense of cool. Know also that its location feels slightly off the beaten track which also gives it an air of mystic. These days the building not only provides the space for La Soupe Populaire, but it is also houses an art gallery and the very, very cool Crocodile Bar. A multi-millionaire investor bought the site recently and his intention is to transform The Studio House into something bigger with a hotel and many restaurants. La Soupe Populaire is just the start. In keeping with the design of the large industrial space, La Soupe Populaire has been decorated with vintage furnishings, minimalist table settings and a warm lighting that gives the restaurant a great sense of coziness. Tim Raue might be a 2 Michelin starred chef, but his intention for La Soupe Populaire was that this was to be the people’s restaurant. As such the standard menu, which shows off some true Tim Raue classics such as his famed mustard egg, oozes accessibility with its limited options of four starters, four mains and two desserts. But there’s also a concept piece to the menu with some additional dishes being devoted to honouring and complimenting the nationality of the artist who is on show at the time. These dishes change along with each exhibition change about every three to four months. Also of note at La Soupe Populaire were the prices that were exceptional value for this calibre of cooking. To start our meal we were presented with some fantastic crusty sourdough bread and a wonderful selection of homemade pickles and a hearty meaty German sausage. 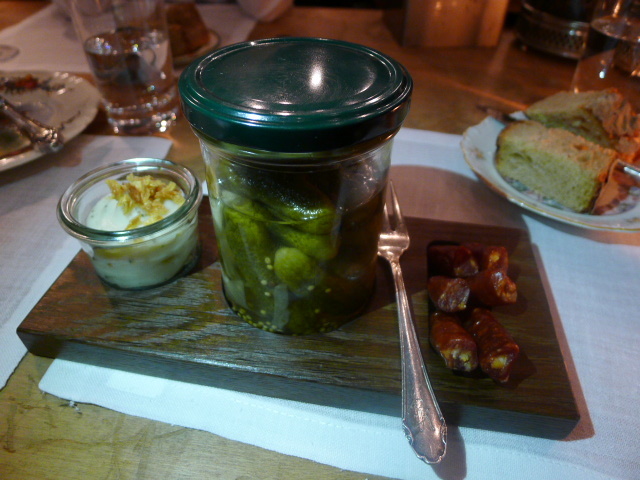 For the bread, there was a spread of lard with roasted onions and pickles. On a recent visit to Berlin, I went to Margaux Restaurant, a Michelin one star restaurant which came highly recommended from Victor’s Gourmet Restaurant’s chef, Christian Bau. After having had perhaps the best meal of my life at the latter restaurant, I now rate Bau as one of my favourite chefs of all time. So when Bau recommends a restaurant to try, it’s a suggestion that’s pretty hard to ignore. 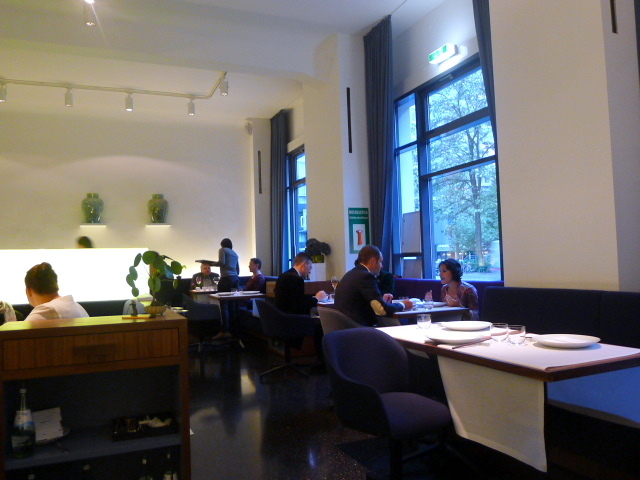 Located on Berlin’s main street of Unter de Linden, around the corner from the Brandenburg Gate, the restaurant is imposingly striking. There is sleek walnut panelling interlaced with creative ‘mother-of-pearl’ type lighting as the restaurant’s backdrop. The seating is of a mustard colour which complements the white linen tablecloths nicely, and there are other warm and sophisticated touches throughout.